Sparring is light contact practice with an opponent to allow the students to work on technique, distance, speed, and to gain experience in actually facing an opponent. Light contact sparring is an invaluable tool to allow the participants to try the techniques they have been taught without causing harm to the opponent or themselves. We hold sparring matches at least a few times a month, and each participant wears head gear, gloves, boots, cup and mouthpiece. Shin and arm pads are optional. Loaner equipment is available. The rules include light contact, no rocking of the head, no face impacts, no elbows, and nothing below the belt. Advanced belts are allowed to sweep and follow through to the ground, however beginning and intermediate rank matches will be paused if a participant loses their balance or becomes overwhelmed. Kids classes participant in sparring, however great caution is taken. 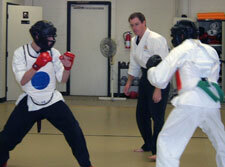 All sparring matches require a black belt instructor to be managing the session. Light contact is strictly enforced. Black belt assistant instructors (other kids) may participate with a beginner or advanced rank to allow that student to try out their techniques on a qualified martial artist who has proven to be able to protect themselves and show restraint should the beginning or advanced student make a mistake. Padding weapons sparring is also a dynamic partner activity. It allows the students to practice weapons skills in real time. They may use the foam bo staff, nunchacku, tan bo, or sword. Occasionally we participate in sparring with full contact so that the full impact of the competitors blow can be experienced by both participants, the recipient as well as the deliverer. This type of kumite is called bogu kumite. The purpose of practicing this form of kumite is specifically to discourage students from the attitude that sparring is fun. There is an inherent risk of injury in this practice. However it is a vital experience for the student to feel the impact of a blow of this magnitude to be able to understand the importance of preventing it. This experience should remind the competitor that karate training should be focused on the protection of oneself and not so much on the scoring of points. Participation is voluntary, and protective head gear and gloves are worn.